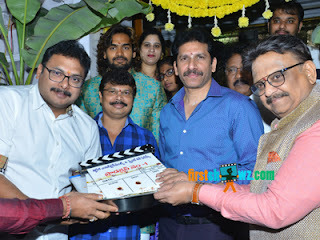 Boyapati Srinivas clarified the clap with hero and directed the hero. Actors Ali and switched camera switched on camera. Speaking on the opening ceremony, SPP said: "Anil kadiyala and adivasi kadiyalu couple of me know through television. I go to any movie openings. Such a couple traveled so far and so hard. It was my responsibility to come to the opening cinema of their journey and to bless them. All the best for another producer Tirumal Reddy and director Arjun Jandhali. Director Boyapati Srinu said, "Arjun, who had traveled with me for twelve years as an associate with me, was like my brother. Talent and timing And these producers are the best friends from the beginning. The hero is sure to get a good name through this film. " Director Arjun Jandhali said: 'My teacher and brother All in One is all gone. I'm promising to make his name somewhat diminished. This movie is so early that the hero is Karthikeyan. He told me that when I tell the story, I would like to enliven the belief in the story and make our film before. My producers believe me and encourage me every technician I ask. Thank you for giving all this a good opportunity. Hero Karthikeya said, "After releasing 'R-100' I heard many stories. This is the best story for all the stories I heard. That's why I'm waiting for the movie to start when I'm shooting. Producer Anil Kadiyala said: "Thanks to the audience who are watching our shows for the first time we are in TV media. To bless the film unit, we have a great love for Boyapati and Gurus Thilak Thangal. How blessed we are on TV is that on the silver screen I want my partner Thurmal Reddy to bless us all. We believe in the story on the story. The film will definitely succeed. This is a remake of the hero for Karthikeya. " Leading producer DivV. Danaiah, Miriala Ravinder Reddy, Praveen and actors Hema and others participated. Music Director: Chaitanya Bhardwaj, Camera: 'RX 100' Fame Ram, Art Director: Jayam Shekhar Executive Producer: Shiva Mallaala.